Many children around the world like to write letters to Santa Claus, and Santa Claus loves to receive letters from children. 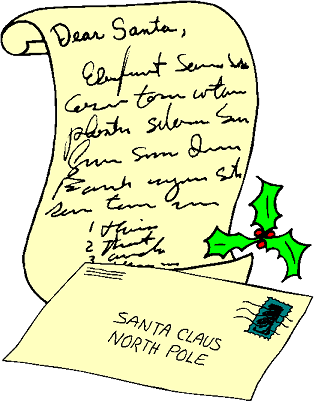 If you write a letter to Santa, it is okay to include a Christmas list (telling him the sort of presents you would like), but your letter should always include best wishes to Santa Claus and his team! Make sure to thank Santa Claus, Mrs Claus, the elves and Santa's reindeer for all their hard work. And, of course, you should be sure to wish them a Merry Christmas too!